Adina Rahman, a Bethpage High School sophomore, raised $600 to benefit the Lupus Alliance of Long Island/Queens. This is the third year Adina has collected money for this worthy organization, garnering a total of $1,600 during that time. Adina said she was motivated to raise money for the alliance because of family members who struggle with the disease. Patricia D’Accolti, executive director of the alliance, thanked Adina for her generous donation and explained that the funds will contribute to the alliance’s efforts to promote education and public awareness as well as provide support-based programs for those living with lupus. 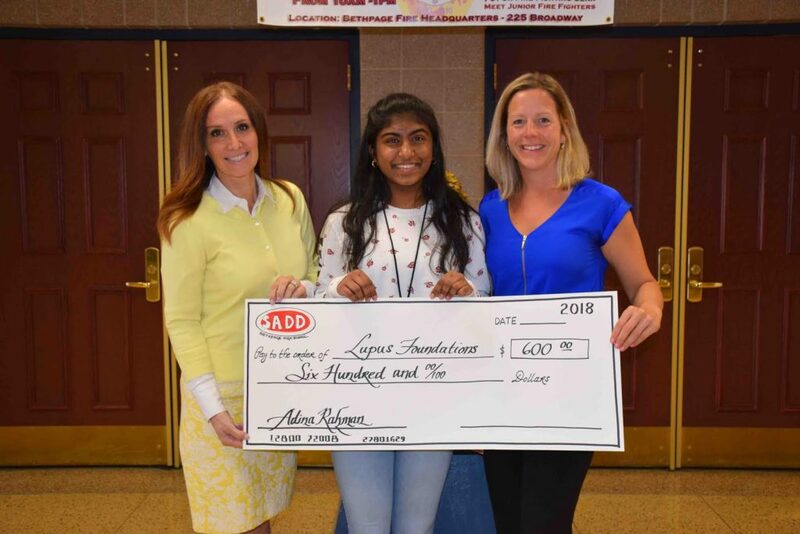 Photo caption: Bethpage High School sophomore Adina Rahman (center) raised $600 for the Lupus Alliance of Long Island/Queens. She is pictured with Executive Director Patricia D’Accolti (left) and school social worker Christine Kennedy.